Snap Off Knife, "Hyper-AL type"
This review is about item#2201272. Cardboard is also excellent at the spa and spa. I'm going to use this in the future. This review is about item#6416846. When cutting wrapping paper, packing work etc. I will use it as it is without breaking, I thought that there was a knife without cheap creases. Will it be cheap if there is no demand? 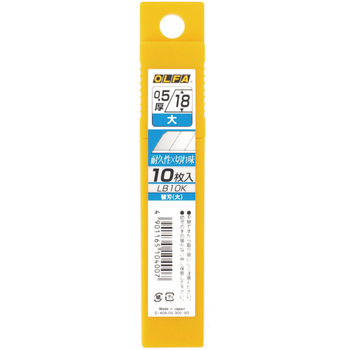 I purchased it as a replacement blade of a cutter for breaking large baggage and for cutting the rope. Even thick ones are useful because they are crisp. I will purchase it every time. It can be used without problems, I am satisfied. It is strong, I am using it all the time because it is worth more than elsewhere. It is best to use a cutter and cut well, it is best that it is convenient and easy to use. It is a replacement blade of Olfa. It is neither over nor below it. It is rich in inventory and will be delivered as it will be delivered the next day. I use it without any problem. I send it so useful. Purchase usual favorite items, free shipping measures. It's not cheap, but I am satisfied.